I am writing on behalf of the commercial fisherman in Hancock County, MS as well as all the commercial fishermen in the Gulf Coast Region that were put out of business by the storms of 2005. The Federal Government is once again turning its back on the independent commercial fishermen. While it has promised millions in aid for the Gulf Coast, NONE has been given yet. No assistance in clearing out boating lanes. No assistance in loans or grants to establish the support industries surrounding the fishermen. No assistance in helping the fishermen rebuild their homes, their boats, their lives. These fishermen, some with boats but no homes, some with homes but no boats, and many with neither need their livelihood restored. They need your help. Seafood prices may or may not increase due to the decline in supply. There is a good chance buyers will seek out foreign markets to fill their needs, taking all North American fishermen out of the loop and out of business. By assisting the fishermen in the Gulf, the American fishing industry will remain far more secure. I know times are difficult with rising fuel costs and declining fishing grounds. However, even the most modest assistance, couple with the show of solidarity and support will do more to assist these fishermen than huge sums of money. You can help by sending supplies, materials to help rebuild homes, volunteers to assist in any and all clean-up, help establish new support businesses (fueling, ice, packing, shipping). The entire fishing industry has been destroyed through 3 states – Alabama, Mississippi and Louisiana. If you have any questions or comments regarding this request, please contact me at your earliest convenience. Well, spring is definitely here. 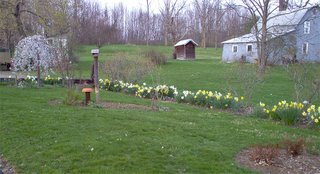 Daffodils, fruit trees, lilacs are all in bloom. Iris, allium and peonies are all getting ready. Dry as dust, but that's why perennials are such great things. Not nearly the need to water. Anyway, life remains busy here. I'm back to making phone calls because all are so busy that email is just the last thing they want to do. I don't blame them one bit! Life must be so overwhelming. But - because of the phone calls, I get a far more accurate idea of what all is going on. So, in the coming weeks, I will be adding another round of town, city and county organizations. I donated a quilt to a cute little 4 y.o. who donated her bone marrow to her 6 y.o. brother. It's the pink one on www.FullCircleQuilting.Blogspot.com Have offered to make one for the brother once he's out of isolation, so we'll see what happens. Met with Deb vD. Very cool lady! Very excited to be getting started on helping. There is so much to do that she's as overwhelmed as the rest of us! But, courageous enough to start anyway. Have written letters to medical clinics in the area to hopefully get some volunteers for the Pass Christian medical clinic since the BSL Medical Clinic is no longer needed. Am going to be taking the blog in another new direction. Since I am getting so many organizations and agencies within Hancock County AND volunteering for Hancock County, the Sunday post of needs and updates is getting incredibly big - and to me - too big. So, the Networking blog is going to remain exclusively Hancock County organizations and agencies - such as the municipalities, the Chamber of Commerce, the schools, etc. The Advocate blog (www.KatrinaAdvocate.blogspot.com) will hold the letters that people can write, and the volunteer agencies from around the nation that are helping (and advocating) Hancock County such as City Team, One House, BRICK Layers, etc. I changed my mind. LOL - I've added 3 new blogs - and those will work exclusively for each town I've got information for within Hancock County. I will be submitting them to the search engines once I have the information transfered, which will hopefully be this weekend. I'll alert all by email as well when it's been done. I'll be starting that this week, so if some links don't work right, it's because I haven't finished the change-over. I do plan on having it changed by Sunday for the main post. I will also explain then the format - which I'm also unsure of how it's going to look. [grin] - This is definitely a matter of INVENTING the wheel - no re-invention going on here. On the RisingFromRuin site at MSNBC, there have been statements that folks around the nation are asking the news agencies to STOP running Katrina news. We can't let that happen. People NEED to write letters to the editor, write local businesses and agencies to continue assisting, etc. this recovery will take up to a decade. And it's only been 8 months and folks are already grumbling that they've heard enough. Too bad. They need to keep hearing it. Keep being their voice. They are still so isolated that they need us to be their voice. It's amazing how quickly things start growing once the switch is turned on. 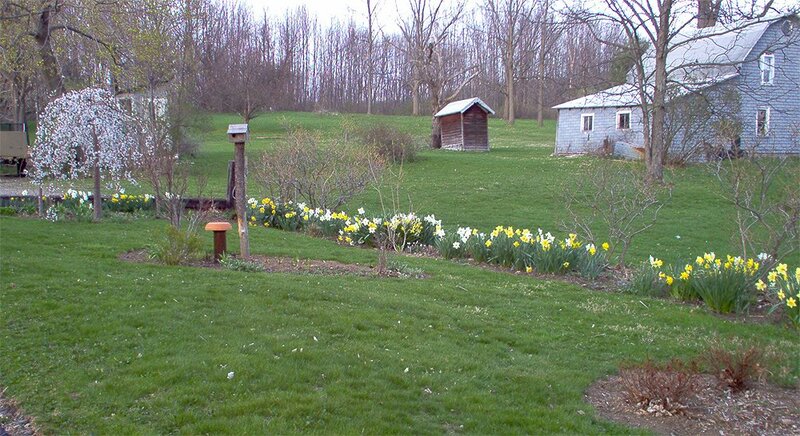 The daffodils are done, the lilac are in peak bloom and the blueberry bushes are feeding our humming bird very well. This is going to be a slightly longer version since I am feeling the need to explain some stuff. First off, I want to thank everyone who contacts me on a regular basis. Without you, this couldn't be possible. See, I'm disabled. I have been for 5 years now and this is some sort of watershed year. Dealing with the disability that isn't going away after having been something of a work-a-holic is devestating. I've improved, but not enough to get back to work. I have a thing called Vestibular Neuritis. A virus attacked my right inner ear and destroyed several nerves. It even damaged the one that works the right side of my face - so when things are flaring up, my face goes numb, I can't always talk right, I bite my lip, I choke on liquids, etc. And - it caused never ending dizziness. I can't go hiking anymore, I can't drive, I can't be in crowds, new places. Reading is a significant challenge, as is writing. Talking on the phone with a new person is difficult, which means I shouldn't make more than 1 call a day for this project, but I usually make about 3 when I'm able. The symptoms ebb and flow and there's no cure. There are few meds that work for VN, and only mask the symptoms, they don't resolve them - even temporarily. The dizziness affects your ability to think straight, think confidently, assimilate information and do critical thinking. And it's invisible. The only thing people might see is the slurring of speech and the inability to walk a straight line. So, the natural assumption is that I'm drunk. And I really don't care if people think that. That's the least of my worries. All that worries me is improving, which must be measured in years, not days, weeks or even months. I can't even compare seasons because each season brings on new challenges. Spring and summer are my best times - I can be outside and work in the yard as occupational therapy. Autumn and Winter are the worst. I can't get outside nearly as much and the storms really screw with the vertigo. It's called "decompensation". If you don't use it, you lose it. So, every year I have to regain what I lost from the year before. Hence - annual measurement of progress. Most people who know me don't think of me as disabled. They see how much I get done in a day. What they don't realize is that it takes me the entire 17 hours I'm not in my bed to get those 3-4 hours worth of work done. And if I don't take a nap every day, I'm laid out for the following two days. So - the reworking of the blog into individual blogs was a major effort for me. I've done additional work on them, but have needed to take most of this week off to let my brain and eyes recover from the effort. I have started a new letter writing campaign, which I will post to the Katrina Advocate blog. Please ask people within your circle of friends who may not be able to go down that writing letters and making phone calls can be at least as effective as their 2 hands would be, working on the Coast. One letter is to the Habitat For Humanity Restores - where they sell reclaimed materials from houses being remodeled or torn down to continue funding their efforts. I'm asking that they donate a portion of these materials (that are new surplus as well as the reclaimed) to the relief effort in Hancock County. One from FL has already said yes, and I have friends in FL working out the shipping logistics. Another letter is to the local school districts. I am writing on behalf of the One House At A Time Project in Pearlington in hopes of getting a new set of volunteers for over the summer. What better pool of potential volunteers than teachers?! Even if your school district as ended the Spring semester, the teachers will be in the school for at least 10 days after as well as having summer programs that they will attend, so reaching them as a target audience isn't gone for most locales. And finally - Bob Putnam - a man who wrote to me because he took offense to something I wrote in a private email that was forwarded to him by one of my friends has proven yet again The God Thing. If I hadn't had the blog and if Yvonne hadn't found my blog and if she hadn't posted a comment and if I hadn't written that private email and if someone hadn't forwarded it to him and if he hadn't gotten so offended that he wouldn't email me, I never would have known he would be such an asset to the fishing community. I really think God is in the word "if". That's why, throughout this whole thing, I try to enact "Principle Oover Personality". I don't have to like the people to do good work with them. All I need is accurate information from them and I'm a happy camper. So - to all - keep the faith. Keep working. One Day At A Time. Progress. That's all we need - is progress. Can you tell I've run out of pictures of me? Ahh well. 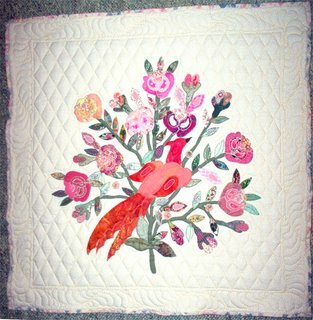 This is a picture of a wall hanging I made for a friend's first grandbaby. The design is about 200 years old I think, and I used over 60 different pinks and about 24 different greents on a cream background. This was a GREAT project! Anyway, this is a better week. I'm not as dizzy, but still not well enough to do as much research as I normally do. I'll be able to do more this coming week. Maybe even today. Great news all around. Trish - of Foundation Hope (www.Foundation-Hope.org) has suggested a collaboration between her organization, an organization named HANDS (look in the 3 town's blogs for more info) and my blogs in hopes of creating a very active Family Connection Program. HANDS has started it, but the more places people can find the information, the better chances of it being highly successful. I hope to post more about it as we all communicate and firm up our respective roles. But, I truly think this will be an amazing project! The Giving Circle people are hosting folks from Waveland to come up to Saratoga Springs NY the last weekend of June for a sister city type agreement. I can't wait! This may be my only chance to meet folks from down there. I'm so excited! And hopefully, the above named project can join in as well to really collaborate efforts. A gentleman that Trish knows - Scot - wrote a book and is donating proceeds to the relief effort. Once I get more information from him, I'll be posting it. If you'd like to see the book before hand, please go to www.chasingsolomon.com. It looks very interesting - my kind of life. I am considering - but not fully decided - posting information on businesses that are contributing significantly to the relief effort. This way, if people wish to support those who support the rebuilding, they have an index to refer to. I'd rather keep it as small businesses since I'm from a family of entrepreneurs, but will include the larger ones since there are partnerships being formed as we 'speak'. If you know of any, please let me know and I'll most likely make a single post that is updated as often as necessary and linked to all the blogs. I continue to send requests to the Habitat Restores since the materials they sell are exactly what the Relief Effort needs. I'm asking they donate a portion of these materials to the effort. Since so many do not have email, I will be needing to send snail mail out in the near future. If anyone would like to take up that cause - as there are Restores in every state, please email me and I'll give you the information I am sending out. Right now I am still sending letters of request to volunteer to the local schools - they haven't dismessed for the summer yet, so am hoping I can get some teachers and staff to come down for a week or two during the summer months. Since many have second jobs in the service sectors we need volunteers in, it may just work. I'll let you know. As always, if you know of any organizations within Hancock County that I could post information about, please let me know. KatrinaCoalition@aol.com I want as much representation as possible to better help the county. Please go to www.habitat.org/local. You will find a link there to help you locate your state's "Re-stores" to email this letter to. Since much of what they sell at these stores is what is needed to rebuild and restore the Gulf Region, it only makes sense to donate even just a portion of those goods to the affected areas. Did you know it's close to 300 counties that were affected? Imagine that kind of destruction on that level anywhere in the world without massive national assistance. It would be impossible. I am writing on behalf of Hancock County and the entire Gulf Region for sustained assistance through your Habitat For Humanity “Re-Store”. By donating a portion of the building supplies to church groups or other organizations in your area that are assisting in the hurricane ravaged Gulf, you are assisting them in ways that are immeasurable. All too often, rebuilding efforts are stalled for lack of building supplies that cost 2-3 times the national average. Warehouses and storage facilities exist if the supplies you send cannot be used immediately. However, since most groups communicate with each other while in the region, the materials will not likely find their way to storage. While you may not physically be able to assist as a group or an individual, donating portions of your Re-Store supplies will be of far more assistance than you can fathom. Outlets, junction boxes, wire nuts, etc. Obviously, all materials are needed. But knowing space is limited in any organization’s caravan to the affected region, the best approach is to take the most of what fits. If you have any questions regarding this request, please contact me at your earliest convenience. Send this letter to your county's police agencies and even your state police. The Gulf Region's police are being adversely affected by the entire catastrophe. Most are working with 30% fewer officers due to stress related issues, are seeing an increase in violent crime, with that crime becoming more violent and being directed at the police in ever greater frequency. A true emergency is developing without the assistance they need. I am writing on behalf of the law enforcement agencies within Hancock County, MS. Contrary to popular belief, all is not well on the Gulf Coast since hurricane Katrina passed through. Hancock County, the poorest county of the poorest state in the nation, was hardest hit by Katrina and has had the least news representation. The county lost 70% of all structures during the hurricane and another 15% to mold and insect infestations. They have few phones, little potable water, incomplete electric service, 4 gas stations and 2 grocery stores for the entire county. The tax base has been wiped out with no budgets for the towns and county to work with, but still in need of emergency services. Most police departments are working with at least a 30% loss of manpower and an ever increasing rate in violent crime which is being directed more and more toward police officers. I am asking you to read the enclosed letter from an assistant to the Mayor of Bay St. Louis, MS to better understand the plight of all municipalities within the Gulf Region. I am then asking you to help. Right now, with gas prices almost at historic highs, these police agencies are in great need of any assistance possible. I ask that you carefully consider helping, at whatever level possible. They need help on a consistent basis, but even a one-time offer will be greatly appreciated. And whether you choose the BSLPD, the Hancock County Sheriff’s department, Waveland City PD, or another agency in the Gulf is entirely up to you. I will assist you in finding an agency if you wish, but my main request is that you don’t forget and that you help as much as you can. I continue assisting because I would hope someone would help us if we were in such need. If you as individuals would like to assist in some way, but are uncertain how, please feel free to contact me at your earliest convenience. All skills are needed by all agencies and organizations within the affected region. Nothing was left untouched by this disaster. Your help, either personal or professional, is needed now and in the foreseeable future. Thank you for your time and attention to the matter. Please send this to your local physician's groups. I looked for ours in the yellow pages and found far more than I thought possible! I sent to internal medicine, family practice and pediatric groups, leaving out the other specialties for now. I am writing on behalf of the Pass Christian Free Medical Clinic being run by United Peace Relief of California. United Peace Relief (www.UnitedPeaceRelief.org) was started by Lynn Meadows, PA in conjunction with AIDSail immediately following hurricane Katrina to help with the overwhelming medical needs in the Gulf Region. Those needs still exist. While some areas are progressing so that the local medical infrastructure can handle the needs of the citizens and volunteers, many are still non-existent. Pass Christian, MS is one of those places. If you are interested, please contact Lynn Meadows at your earliest convenience. The need for staffing, medications and funds remains as great now as it did the day after the hurricane.